There is a reason someone coined the term ‘New York Minute.’ In a city of constant chaos, it is easy to forget to pause and admire the present. That is why Flower Flash is the perfect antidote for the overworked and overstressed residents of New York. 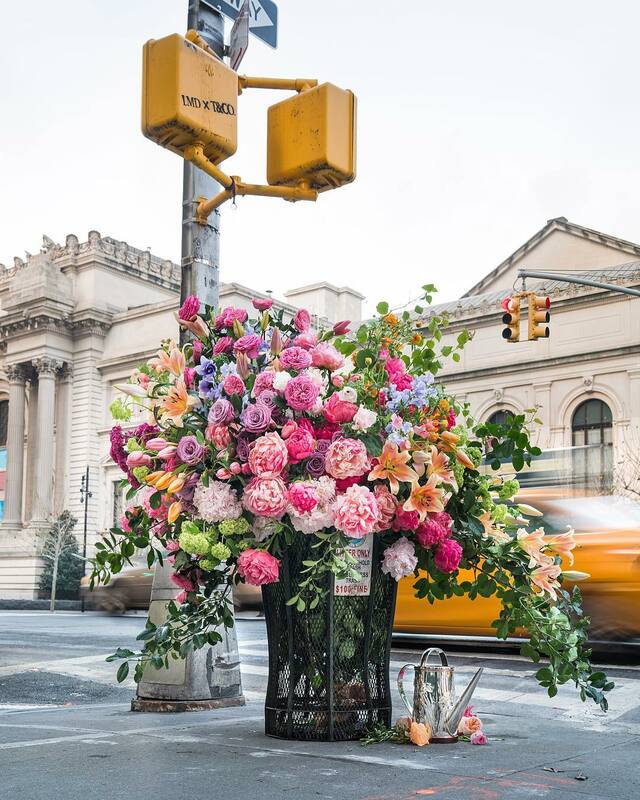 Imagine stumbling across the most majestic floral arrangement on your ever-so-regular commute to work – literally. 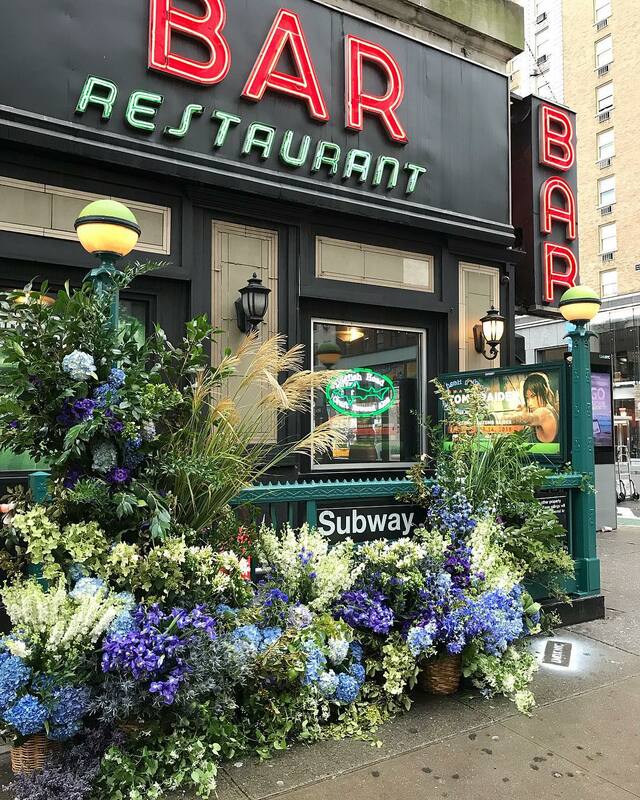 Since October 2016, florist Lewis Miller has transformed seemingly random locations and objects, from subway signs, trash cans and construction sites, into surreal art with his blossoms. Through his guerrilla installations, Miller turns the ordinary into the extraordinary, forcing people to stop in their tracks, and at least for a second, experience something spectacular in an otherwise normal day. The most magical part about all of this is no one knows when or where the next Flower Flash will hit. 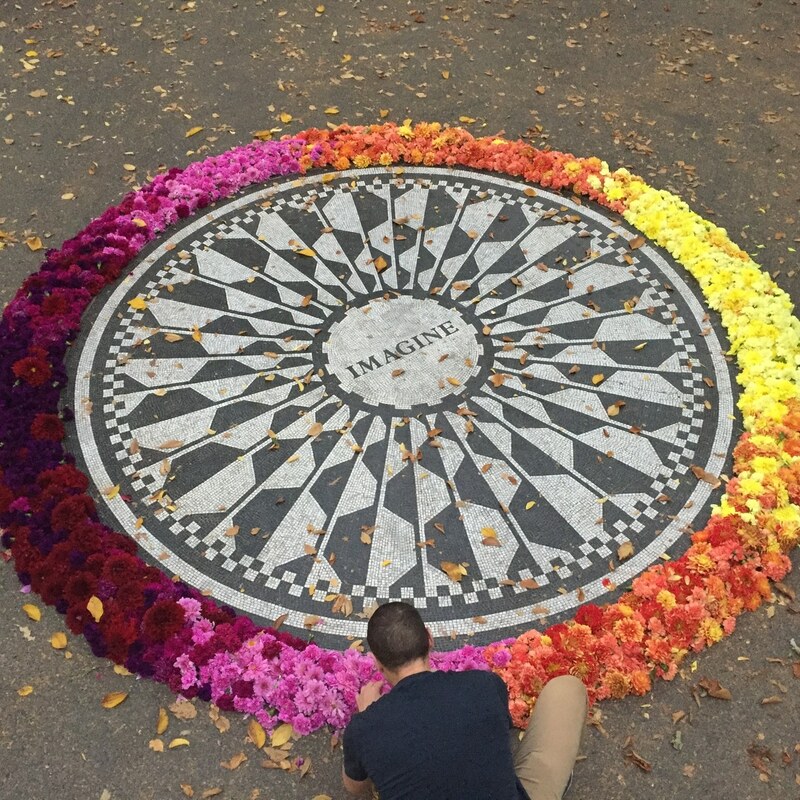 So on one autumn day in 2016, Miller and his team filled up the van with 2,000 flowers at 5:45 a.m. and descended on the John Lennon Memorial in Central Park. By the time the rest of the city was awake, the IMAGINE mosaic had been turned into a “psychedelic halo” of multi-colored carnations. 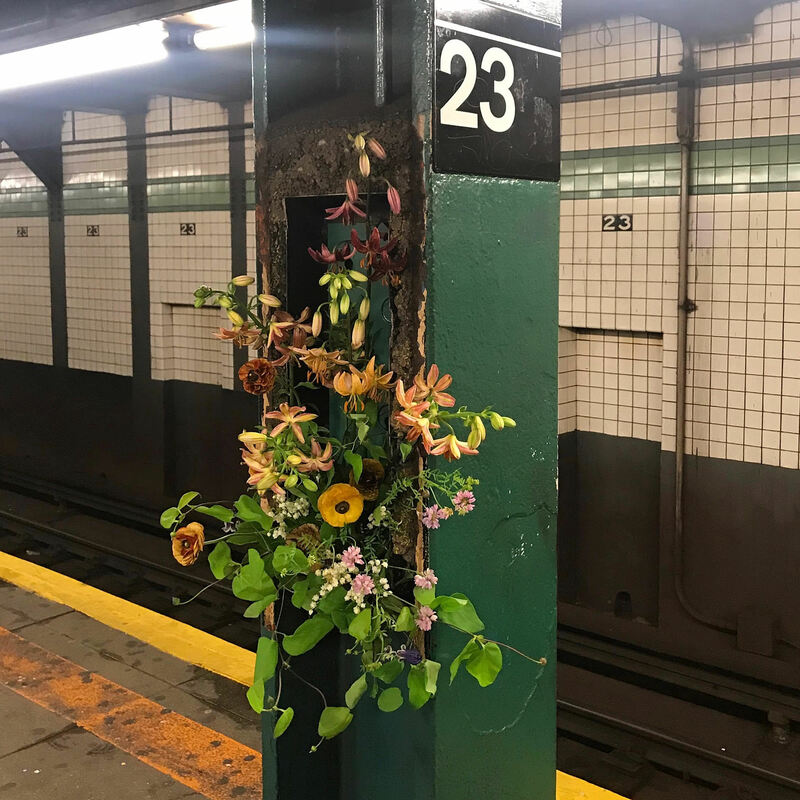 Miller had no idea how people would react, but with the help of social media, his first Flower Flash quickly gained exposure, and the firm’s small experiment snowballed into a shared experience in a city of millions. 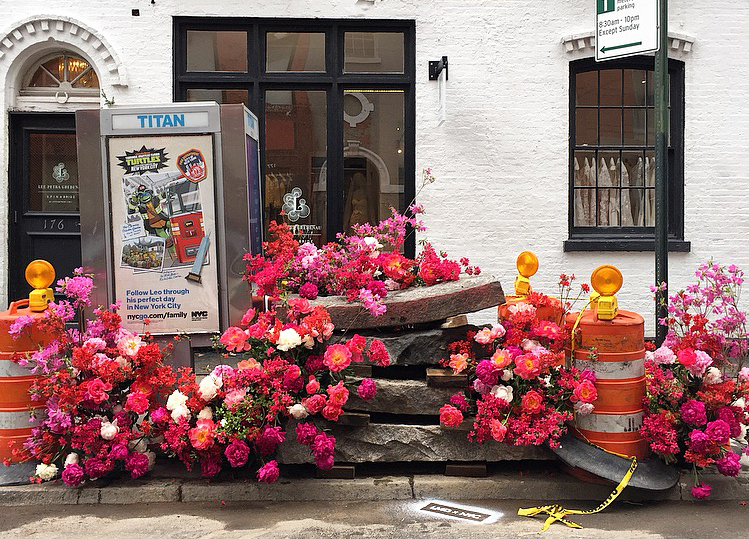 “In this age of social media, we saw the fruits of our labor and were instantly rewarded via Instagram,” the florist wrote a day after his first Flower Flash. Today, a quick look at #LMDxNYC on Instagram shows thousands of flower photos taken by passersby all over Manhattan. 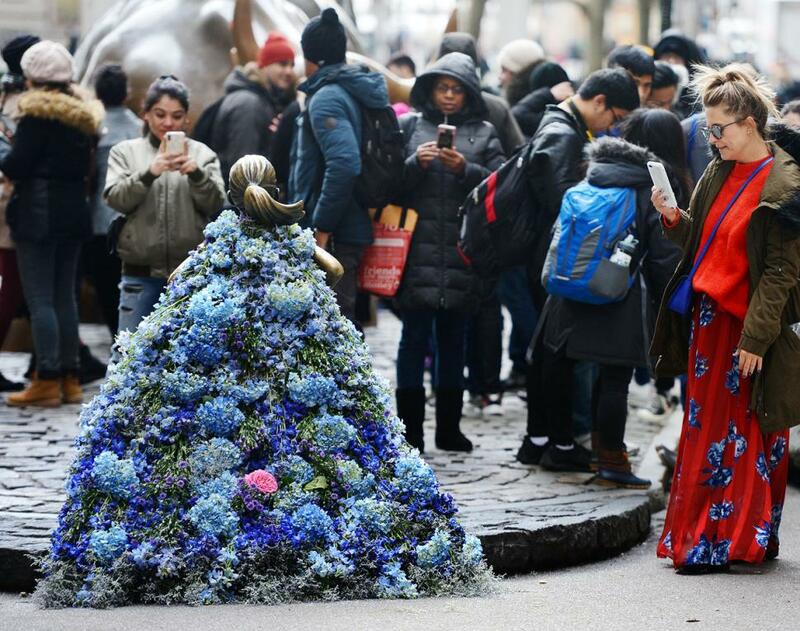 The art project has even caught the attention of big brands like Farrow & Ball and fashion giant Old Navy, who collaborated with the firm on International Women’s Day to Flower Flash five historical female statues in the city. Earlier this year, designer Tory Burch even donated 14,000 pink carnations from her Fall/Winter 2018 show to Miller, who then used the blooms for his Valentine’s Day pop-up. Though the installations are fleeting – part of the beauty of it all is how transient it is – the project takes quite some planning in advance. The team works very early and very fast every Flower Flash to finish each installation before the morning crowd floods the street. Within the first few hours of the day, photos of the latest pop-up will have already taken over New Yorkers’ Instagram feed. That is part of the fun for the firm though; the element of surprise is what makes their work a “random act of kindness” to the city. So if you find yourself traveling to the Big Apple this holiday, you might just be lucky enough to stumble across one of Miller’s creations. Whether you are casually walking around town, waiting in line at a diner, or scrolling through your Instagram feed, be on the lookout for Miller’s next move.